Send us your best honey bee-related photographs to enter the sixth annual Vita international photo competition. The overall winner receives a cash prize and eleven others will appear in the Vita 2018 limited edition calendar and feature in Vita’s monthly email newsletters. All winners receive a copy of the calendar. The deadline for entries is 22 October 2017. Entrants may submit up to four photos (preferably each 1-2 MB in size) by emailing them to gallery@vita-europe.com. Photos can be on any relevant topic relating to honeybees and beekeeping. Please ensure that photos are of high enough resolution for printing. The competition will be judged by an international panel of beekeeping specialists and suppliers. 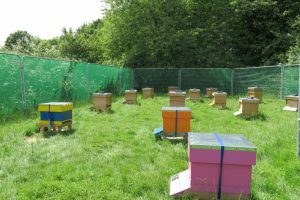 With the help of local beekeepers, Vita (Europe) Ltd has opened a test apiary near its Basingstoke headquarters to complement its other test apiaries across the world. 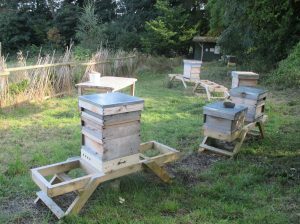 The apiary, on a large allotment (community garden plots for fruit and vegetables) within easy foraging distance of Vita’s offices, will be managed by some beekeepers from Basingstoke and Paulo Mielgo, Vita’s technical manager. The Basingstoke beekeepers, who are experienced in allotment beekeeping, have constructed an apiary perimeter fence, for security and to ensure that the bees fly well above head height on foraging trips, as well as a small apiary shed to hold beekeeping essentials. Beekeepers are invited to apply for Vita’s 2017 award for honey bee health initiatives. A new feed for honey bees from honey bee health specialist Vita (Europe) Ltd will help boost colony health and increase honey production. VitaFeed Nutri is a rigorously tested, GMO-free nutritional supplement that can be used at almost any time of year to promote controlled colony growth. Packed with easily digestible proteins, VitaFeed Nutri can make up for nutritional deficiencies in honey bees’ diet, thereby stimulating egg-laying, extending bees’ lifespans and ultimately increasing honey production. 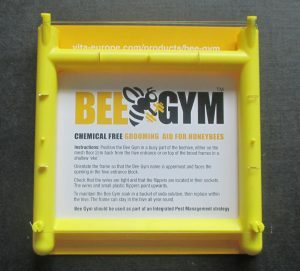 A New Year resolution for bees – use the Gym! Beekeepers can help their bees control their greatest enemy, the varroa mite, by giving them a Bee Gym, supplied by honey bee health specialists Vita (Europe) Ltd. The Bee Gym provides a low-cost, chemical-free and sustainable way of helping honeybees groom themselves to get rid of varroa mites. 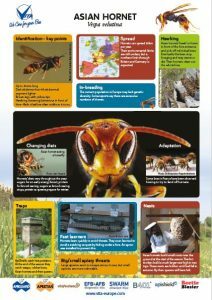 The latest threat to honeybees, the Asian hornet (Vespa velutina) is the focus of the latest in series of free and downloadable infographics from Vita (Europe) Ltd. This third infographic from Vita gives at-a-glance information about the Asian hornet, a growing threat as it expands across western Europe. 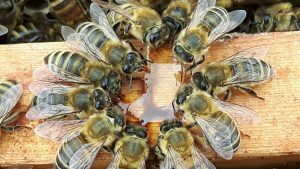 The overall winner of Vita’s 2016 international photo competition is Lester Quayle with his image of industrious housekeeping honey bees. May Smith is the under-16 winner for her striking photograph of a pollen-carrying honey bee just landed on a brood frame. Entries will appear in the limited edition 2016 Vita Calendar distributed to Vita’s global network and the winners. Some of the photos are below and a pdf file of the full calendar is available for free download to users of the Vita Gallery www.vita-europe.com/beehealth/gallery. The Stroud beekeepers’ association apiary with Apishield Asian hornet trap in place. Vita has donated eight ApiShield Asian hornet traps to a group of Gloucestershire beekeepers to help establish how far the latest threat to honey bees has spread in Britain. Vita’s ApiShield traps replace existing hive floors and attract hornets, wasps and even robber bees in by side entrances where they become trapped under a wire mesh and cannot exit through the cone entrances. Meanwhile, the honeybee colony uses and protects the front entrance to the hive. Beekeepers can periodically inspect the traps to see if any Asian hornets have been caught. 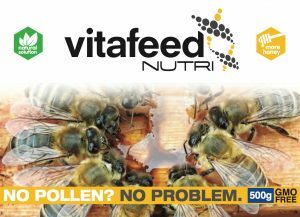 VitaFeed Gold, Vita (Europe) Ltd’s product to stimulate the development of honey bee colonies, will no longer be available in the UK and Germany for economic reasons. It is still available in many other countries. 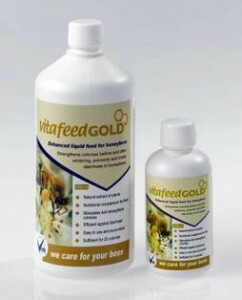 A recent decision by the British Veterinary Medical Directorate means that VitaFeed Gold must undergo the full regulatory process. While Vita is very supportive of regulatory controls of products and treatments for bees, the cost of the documentation and research required to gain regulatory approval for this particular product is uneconomic. All other Vita products, including Apiguard and Apistan varroa treatments, remain unaffected because they already have regulatory approval where required. 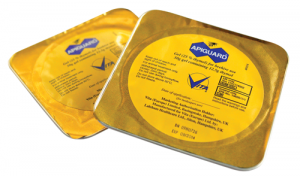 Apiguard, the organically-approved varroa control treatment from Vita (Europe) Ltd, has just been approved for use in Australia. It is the first varroa control product to be approved by the Australian authorities. Based on thymol and delivered in a slow-release gel, Apiguard is extremely easy to use and very effective in controlling varroa populations. It is a proven worldwide success, has been through a rigorous authorisation process and is successfully used in up to 60 countries across the globe.